From the complicated & kooky mind of Jared Hess, the man behind Napoleon Dynamite, Nacho Libre, and Gentlemen Broncos, comes another off-beat comedy about a man who sees the world through his own, unique, slightly alarming lenses. Hess struck random gold with Napoleon, creating a short film first based on the most awkward character you will ever seen on-screen, delighting audiences with a story that even he couldn’t have possibly seen coming. And if Napoleon reached instant cult classic status, Nacho Libre gained its own sort of secret fame, becoming beloved in a very unusual way. 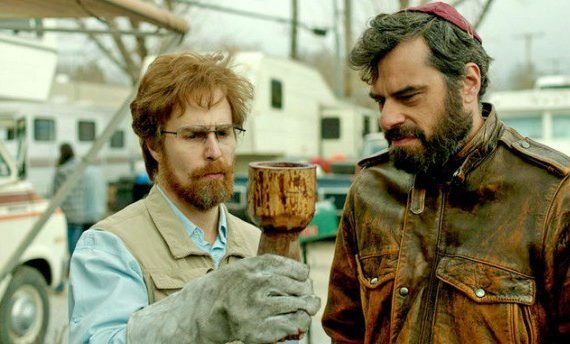 Gentlemen Broncos didn’t take off, and neither does Don Verdean, two weird comedies that looked to cash in on the humor of Jemaine Clement and the concept of twisted men hijacking success. Both fell short, as most likely will Hess’ latest, Masterminds, making us wonder if perhaps the magic has faded. Don Verdean is the religious world’s preeminent scholar & expert of biblical artifacts, specializing in locating & retrieving the most hallowed treasures of the ancient world. Though often questioned by those who want “verification” & “facts”, and after falling on tough times, the modern-day Indiana Jones won’t rest until those holy items from Earth’s holy land are resting in safe places where they belong, right here in the good ol’ U.S. of A. Verdean makes a deal with church leader & recent death survivor Tony Lazarus to create a partnership from which they will both benefit; Verdean finds famous artifacts, Lazarus funds the digs, Verdean displays them in Lazarus’ church. Sounds great, now all that’s needed is to find things like Lot’s wife, Goliath’s skull, the Holy Grail, and you know, if you can’t find them right away, a temporary stand-in should be made available; God will provide. Judging by the description & cast of this film, it should have been a home run. A fake archeologist who produces biblical ruins upon request? The faithful who follow both blindly & monetarily? Hilarity and not-so-subtle critique, served up fresh, you’re welcome very much. And who will be taking care of you tonight? Well, Sam Rockwell, Amy Ryan, Jemaine Clement, Danny McBride, & Will Forte, that’s who; how could it go wrong? Yet, sadly, it did, and not just a little, but by epic proportions, especially given how perfect it could have been in theory. It starts so well, Rockwell as a great Verdean, McBride’s lines about Satan farting in his brain & dinosaurs simply being collections of reptilians who coincidentally died together cracking me up. But that’s about it. Jemaine Clement, who I love, was a terrible Borat rip-off of an Israelite, never adding anything to the movie except nonsense, the story fizzled faster than a 4th of July sparkler, Amy Ryan was completely misused, and the jokes continued not to work time & time again, becoming more a bludgeoning than a blessing. I wanted to like Don Verdean, I wanted to laugh, but Hess & Co. failed to make me, and I might be losing interest in his steadily plummeting style.